You now have a new customer number which will help whenever you talk to us online, in-store, or on the phone. You can see this number on My Vodafone or on your bill. You should have already received a security PIN in an SMS for easy access to help and support. Access to your balance, pay bills, track usage real-time, or analyse your payments and part charges. Get all your questions answered with Live Chat where you need it - on your phone. Track your orders or repairs and update your personal details. A. 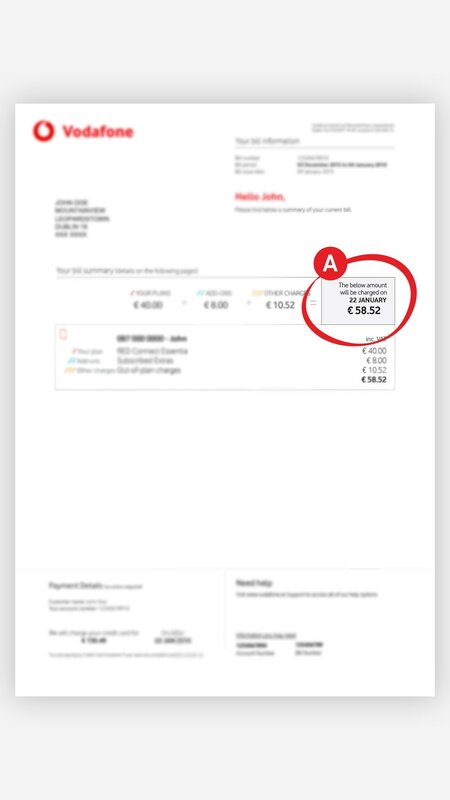 Our new bill makes it easier for you to see exactly what you owe and when you need to pay. Click here to download a sample. B. 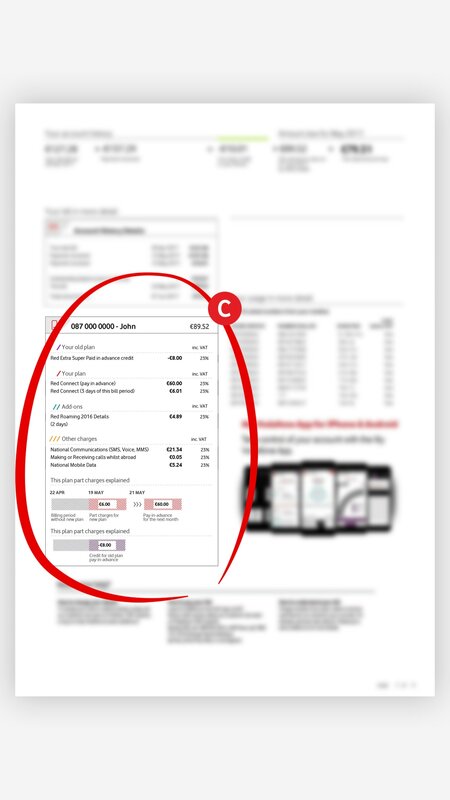 Your plan details, all your add-ons and out of plan charges are clearly displayed. Click here to download a sample. C. Your new bill clearly shows the detail of any part-charges that have been incurred. Click here to download a sample. Coming soon - shop online or by phone, and collect in any store. One team for all your queries by phone, online, or in-store. Coming soon - one bill for all your household. Direct debit is the best way to pay - sign up online or in app. When you change or add a plan / add-on in the middle of your billing cycle part charges will occur. A chart will be in included in your bill in the event of a plan change, to explain the charges. You will be billed from the date your new plan / add on started, and, if applicable, you will be credited for the element of the previous plans that you paid for in advance. What is my new security PIN? Your security PIN (formerly known as your self service password) will allow us to identify you when you self-care through 1907, contact our Customer Care team or visit one of our stores. You can change the PIN by logging into My Vodafone online or on the app. Will my bill or payment dates change? Yes, your monthly bill will be issued approximately 7 to 10 working days later for all future bills. Payment due will continue to be 14 calendar days from when your bill is issued. You will continue to receive your bill notification including outstanding balance and payment date. 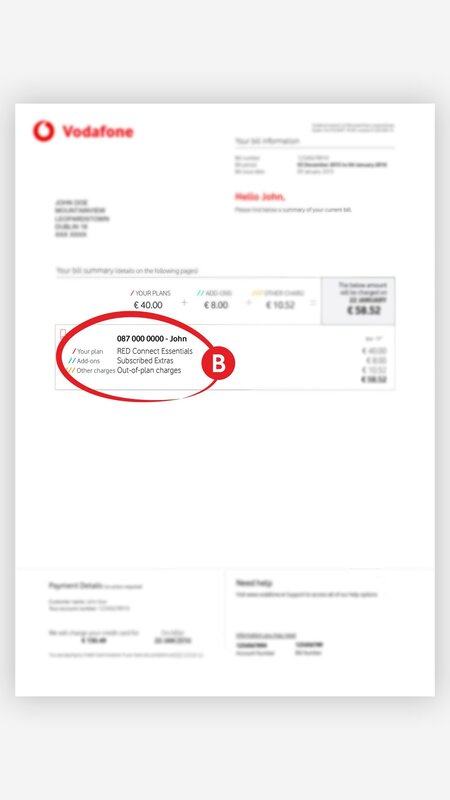 Why do I need to re-register for My Vodafone? Our updated system provides enhanced security on your account. To benefit from this change you will need to re-register for My Vodafone. Please visit the My Vodafone section on www.vodafone.ie where you will be prompted to change your password. Please ensure your new password is more than eight characters long and contains at least one number, one special character, one upper-case letter and one lower-case letter. You can make a payment by credit/debit card through self-care at 1907, contacting our Customer Care team, online through My Vodafone or by visiting one of our stores. The quickest and easiest way is to setup direct debit. You can do this on My Vodafone or call our Customer Care team at 1907. What services will I have after the upgrade? You’ll be able to call, text and use data on your phone as usual as well as access My Vodafone online and app services. For queries, you can call 1907 and speak to a member of the Vodafone or talk to us on Live Chat between 8am – 10pm Monday to Sunday. Our updated system provides enhanced security on your account. To protect your privacy, the Account Holder is the only person who can access the account and monthly bill. If you had an alternative contact on your account, you will need to contact us to have this person added as an Authorised Contact. An Authorised Contact will then have access to your monthly bill and account information. They will be authorised to make various alterations or administrative changes to your account including adding or removing services and products, which you will remain responsible for. You can allow one Authorised Contact to have access to your account and they must be over 18 years of age. Please call us at 1907 or login to My Vodafone to arrange or find out more. You can remove an Authorised Contact from your account at any time by notifying us via 1907. My plan name has changed, what does that mean? This is only a plan name change on our updated systems. If does not affect plan allowances, costs, or terms and conditions. For more information, please see here.